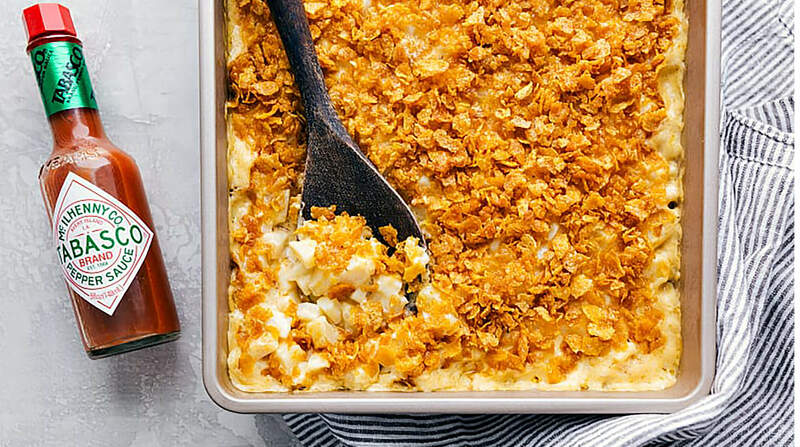 Cheesy, delicious funeral potatoes! These from-scratch funeral potatoes are delicious and simple to make. Recipe by Chelsea’s Messy Apron. 1 and 1/2 teaspoons TABASCO® brand Original Red Sauce, increase to personal preference up to 1 tablespoon! Preheat oven to 350 degrees F. Peel and dice the potatoes. Parboil the potatoes: Put the diced potatoes in a large pot and cover with cold water. Add a teaspoon of salt to the water. Bring the water to a boil and as soon as the water is boiling, let the potatoes cook for 1-2 minutes (depending on size; small cook for 1 minute, larger for 2 minutes). Drain the potatoes and then return them to the dry, warm pan. Allow the potatoes to cool and release their steam for a few minutes. Allow to cool to room temperature before adding to a large bowl. To the large bowl with the potatoes: mix in the milk, heavy cream, sour cream, minced garlic, dried thyme, salt and pepper to taste (I add about 1 and 1/4 teaspoon salt and 3/4 teaspoon pepper; add to preference), TABASCO Sauce, and freshly grated sharp cheddar cheese. Bake for 50-60 minutes, covered. Meanwhile, crush the cornflake topping and mix with the melted butter. Remove the potatoes from the oven. Remove the foil, stir the mixture, and sprinkle the cornflake topping. Finish baking for 15-20 minutes or until potatoes are tender and topping is lightly browned.